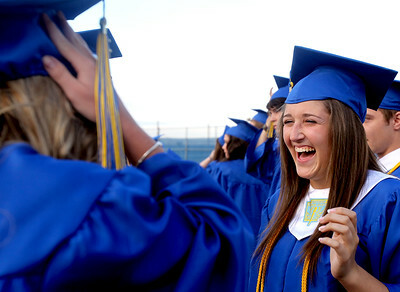 Sarah Nader - snader@shawmedia.com Lauren DeStephano, 17, of Johnsburg laughs with friends before the 2012 Johnsburg High School Commencement on Friday, June 1, 2012. DeStephano plans to study Biochemistry at Indiana University next fall. Sarah Nader - snader@shawmedia.com Andrea Lindal (center) is greeted by staff and faculty before the 2012 Johnsburg High School Commencement on Friday, June 1, 2012. DeStephano plans to study Biochemistry at Indiana University next fall. Sarah Nader - snader@shawmedia.com Jade Dolloff (center) and the rest of the graduation class were roaring with laughter while listening to class president, Dan Fox's speech at the 2012 Johnsburg High School Commencement on Friday, June 1, 2012. 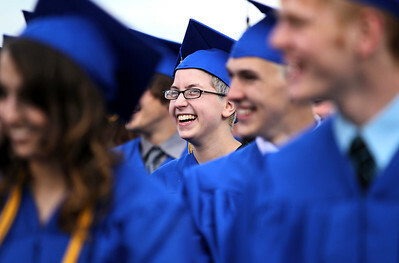 Sarah Nader - snader@shawmedia.com Courtney Kohl, 18, of Johnsburg waits at her seat during the 2012 Johnsburg High School Commencement on Friday, June 1, 2012. 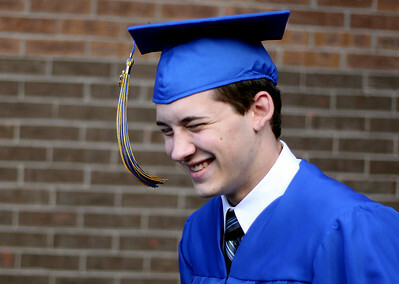 Sarah Nader - snader@shawmedia.com Josh Jewell, 18, of Johnsburg waits in line before heading to the football field during the 2012 Johnsburg High School Commencement on Friday, June 1, 2012. This fall Jewell plans to major in accounting at Northern Illinois University. 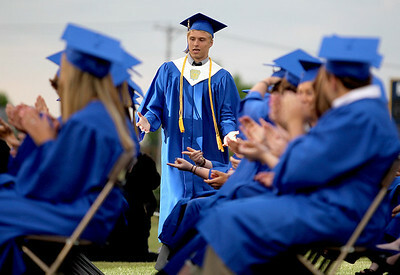 Sarah Nader - snader@shawmedia.com Valedictorian Nickolas Schnell walks onto the football field during the 2012 Johnsburg High School Commencement on Friday, June 1, 2012. Sarah Nader - snader@shawmedia.com Salutatorian Chantelle Mrowka walks onto the football field during the 2012 Johnsburg High School Commencement on Friday, June 1, 2012. 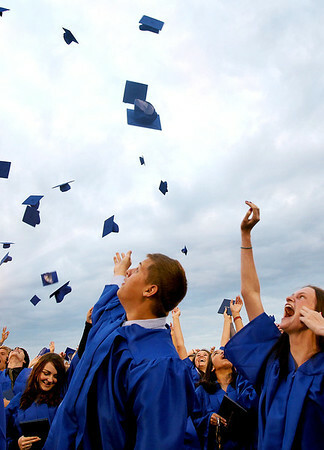 Sarah Nader - snader@shawmedia.com Jennifer Bear(right), 18, of Johnsburg throws up her cap during the 2012 Johnsburg High School Commencement on Friday, June 1, 2012. This fall Jewell plans to major in accounting at Northern Illinois University. Sarah Nader - snader@shawmedia.com Graduates walk onto the football field during the 2012 Johnsburg High School Commencement on Friday, June 1, 2012. 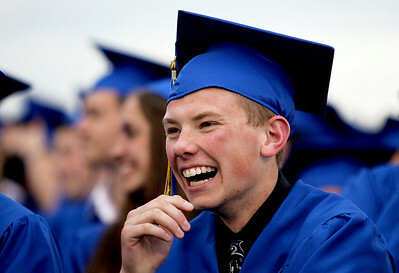 Sarah Nader - snader@shawmedia.com Jason Blumenthal listens to the speeches during 2012 Johnsburg High School Commencement on Friday, June 1, 2012. This fall Jewell plans to major in accounting at Northern Illinois University. 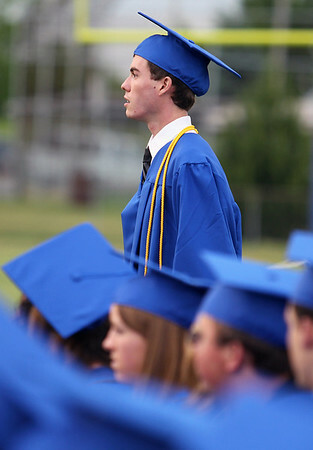 Sarah Nader - snader@shawmedia.com Class president Dan Fox walks back to his seat during the 2012 Johnsburg High School Commencement on Friday, June 1, 2012. 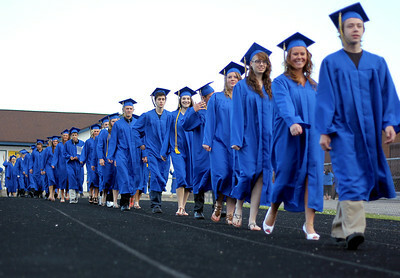 Graduates walk onto the football field during the 2012 Johnsburg High School Commencement on Friday, June 1, 2012.